Last week, Atlanta, GA-based airline behemoth Delta Air Lines, Inc. DAL raised its projection for second-quarter fuel costs per gallon owing to the upsurge in oil prices. Moreover, the carrier trimmed its earnings per share view due to the same reason. Along the same lines, Hawaiian Holdings, Inc.’s HA wholly owned subsidiary, Hawaiian Airlines, raised its outlook for second-quarter jet fuel consumption and economic fuel cost per gallon. On the traffic front, the likes of SkyWest, Inc. SKYW and United Continental Holdings Inc.’s UAL subsidiary, United Airlines, released their respective May traffic reports over the past five trading days. (Read the last Airline Stock Roundup for Jun 6, 2018). 1. Delta has raised its second-quarter view owing to rise in oil prices. It now expects the metric between $2.20 and $2.25 per gallon. Previously, the estimate came in between $2.07 and $2.12. Non-fuel unit costs are likely to rise approximately 3% year over year, up from the prior forecast of a climb in the 1-3% range. Due to the cost headwind, the company slashed its earnings per share guidance for the concerned quarter. The metric is now likely to be in the range of $1.65-$1.75, much lower than the former estimate between $1.80 and $2 (read more: Delta's Q2 TRASM View Bullish, Costs Guidance Bearish). 2. Hawaiian Airlines now estimates a rise of 6-7% jet fuel consumed for the second-quarter (prior forecast had called for an increase of 5-7%). Economic fuel cost per gallon is projected between $2.05 and $2.10. Past forecast was in the $2-$2.10 band. The company has raised its outlook for fuel costs per gallon in 2018. It now predicts the metric in the $2.05-$2.15 range, higher than the earlier projection of $1.97-$2.07 (read more: Hawaiian Holdings Unit's May Traffic Up, Q2 View Bleak). 3. At United Airlines, consolidated traffic — measured in revenue passenger miles (RPMs) — was 19.73 billion, up 6.7% from the year-ago figure. On a year-over-year basis, consolidated capacity (or available seat miles/ASMs) climbed 4.2% to 23.62 billion. Also, load factor (percentage of seats occupied by passengers) expanded 200 basis points (bps) to 83.6% as traffic increase outpaced capacity expansion (read more: United Continental Arm Posts Robust Traffic Results in May). 4. SkyWest reported a 6.7% (10,500) year-over-year decline in block hours (a measure of aircraft utilization) to 145,300 in May 2018. The regional carrier, which remains focused on streamlining its operations, stated that the fall in the metric was in sync with its fleet transition plans. The company aims to reduce the 50-seat jets in its fleet and add new E175 aircraft (read more: SkyWest's May Block Hours Decline, Load Factor Up). SkyWest carries a Zacks Rank #2 (Buy). However, you can see the complete list of today’s Zacks #1 Rank (Strong Buy) stocks here. 5. Although fuel costs have been increasing, air fares in the United States declined in May. Seasonally-adjusted ticket prices in the same month decreased 1.9% on a month-on-month basis, according to data released by the Bureau of Labor Statistics. Also, average air fares (unadjusted) in May declined 6.6% from the comparable figure a year ago. Notably, the May reading marks the second consecutive month of a decrease in airfares. The decline in airfares has been attributed to the intense competition in key markets. Even though, low air fares spell good news for fliers, it is likely to hurt the top line of airline companies. 6. At Southwest Airlines Co. LUV, traffic rose 4.2% while capacity expanded 5.2%. Load factor contracted 80 basis points (bps) to 84.6% in the month as traffic growth was exceeded by capacity expansion. Additionally, passenger count grew 5.3% to 14.43 billion (read more: Southwest Airlines May Traffic Up, Load Factor Down). 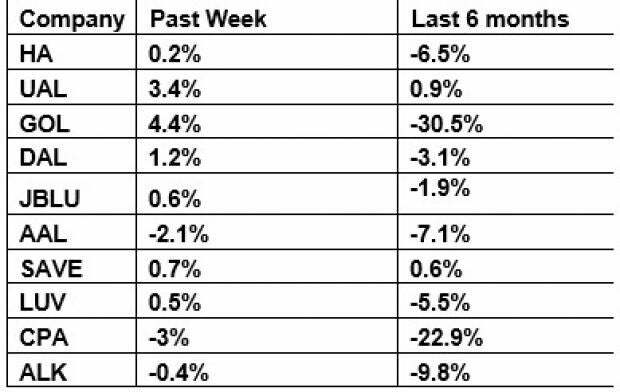 The table above shows that most airline stocks traded in the red over the past week, although the gains were muted in nature. Consequently, the NYSE ARCA Airline Index appreciated marginally in the period. Over the course of the last six months, the sector tracker has lost more than 7% of its value mainly due to high fuel costs and other headwinds. Shares of Gol Linhas Aereas Inteligentes S.A. GOL have declined the most (30.5%) in the period. We expect May traffic reports from the likes of Alaska Air Group, Inc. ALK in the coming days.